Among his many works, Alphonse Mucha’s depiction of Rose stands out as one of the more beautiful designs he created. Many of his artworks focused on the grace of the female figure, and a great deal of his work went on to be used in advertising posters and promotional materials for the arts in the late 19th and early 20th centuries. Right now, the 5 oz Proof Colorized Silver Mucha Collection Rose Round is available to purchase online at Silver.com. Third design in the Mucha Collection. Mintage of colorized silver rounds is limited! Design of Rose from The Flower Series on obverse. 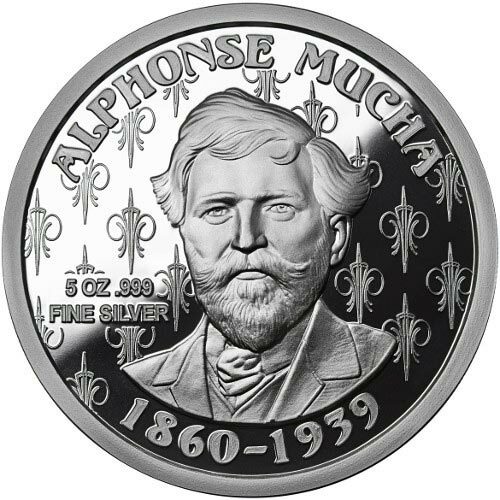 Alphonse Mucha’s portrait on the reverse. All of the 5 oz Proof Colorized Silver Mucha Collection Rose rounds have a proof finish, with a deeply mirrored reflection on the background fields and brilliant colorization of the Rose imagery. Rounds in the Mucha Collection have edge lettering of their serial numbers, which correspond with the Certificate of Authenticity you receive with purchase. The image of Rose came from the Flower Series, which featured a naturalistic design focus and minimal stylization. The Flower Series sold out quickly following its debut from Mucha’s solo exhibition, and Champenois later offered all four panels together on a smaller version that put all the women of the design series together in a single image, rather than four separate offerings. On the reverse of the 5 oz Proof Colorized Silver Mucha Collection Rose Round includes a popular portrait of the artist himself. Taken from a photo in which he is seated, you’ll see only his face in this portrait with engravings of his name, years of birth and death, and the round’s weight, purity, and metal content. 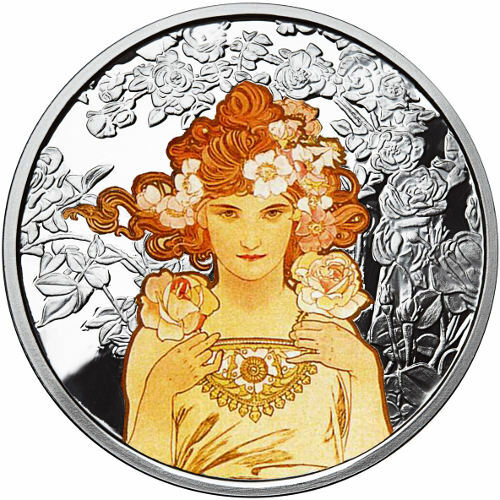 On the obverse of the 5 oz Proof Colorized Silver Mucha Collection Rose Round is the image of Rose. The image of Rose was initially completed as a watercolor made to depict her figure as the personification of the rose flower. This design depicts Rose as a beautiful woman with roses adorning her upswept hair. Anonymous Mint developed the Mucha Collection, which features a total of six planned designs. Coin creator Julie Lindquist developed the concept with Anonymous Mint, and Italian Master Sculptor Luigi Badia worked on the engravings for each. If you have any questions, please feel free to contact Silver.com. Our customer service team is available at 888-989-7223, online using our live chat, and via our email address. Don’t forget to visit our website for a full listing of silver coins for sale online!